Playing guitar fast and clean with excellent articulation isn’t possible when you pick the strings with the very tip of the pick. This bad habit causes bigger problems than you might suspect... Your picking technique, speed and articulation improve massively when you pick correctly. Dig the pick a bit deeper into the strings when you play. Angle the pick about 30-40 degrees towards the head of the guitar. Move the pick to continue slicing through the strings without making bigger motions, even when you dig the pick more into the strings. This causes the string you play to come into contact with more of the pick and makes every note more articulate (without using more effort to hit the strings). 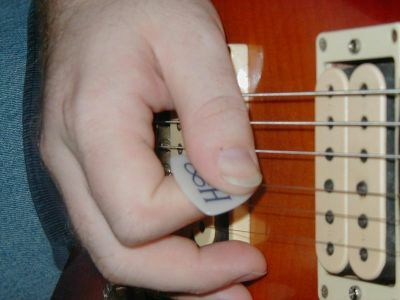 Picking in this way also makes your synchronization a lot tighter because it’s impossible to pick the notes loudly without your hands being in sync. This cleans up your guitar playing so you play cleanly whenever you play fast. Note: Don’t over exaggerate digging the pick deep into the strings. Just dig a bit deeper than you are doing now. Keep in mind that this is just one way to make your guitar technique sound clean. Read this article about improving guitar technique and learn more ways to eliminate sloppiness from your playing. Learn guitar online to take your guitar playing skills to the next level.